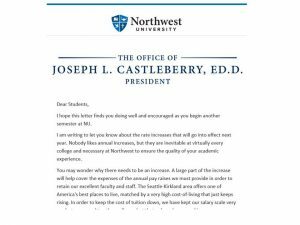 A four percent tuition increase effective next year was announced last Tuesday by Northwest University President Joseph Castleberry via email. The increase will amount to $40,170 total to attend NU, an increase of $1,200 from the previous rate. This number includes room and board and student services fees. According to a 2017 US News report by Briana Boyington, tuition in private universities has risen to a current average of $41,727. NU’s Chief Financial Officer, John Jordan, said the increase is comparable to previous annual increases at NU over the past several years. Last year’s increase was 3.8 percent, however increases have gone as high as five percent in the past. A four percent tuition increase based on the number of students attending NU amounts to $1,040,000. Jordan said NU is still committed to uphold its reputation of generosity when it comes to financial aid. “We only realize about 53 percent [about] $550,000 of [the tuition increase] because of the institutional discounts that we give,” Jordan said. The total institutional aid paid out to students in scholarships rewarding academic merit and athletics amounts to 47 percent of NU’s undergrad tuition revenue. Jordan explained that approximately $300,000 of the increase will provide pay increases for the faculty and staff. Approximately $85,000 of the funds will pay for healthcare provided to NU employees compensating for the rise in healthcare costs. Jordan said NU plans to use $50,000 to $55,000 of the increase for building maintenance and educational expenses. Other campus expenses including utility, maintenance and custodial, with an average annual increase of four percent, will be funded by the remainder of the increase. Previous increases have provided for fire alarm system updates in the residence halls as well as security system updates. Jordan said he doesn’t believe the tuition increase should take too significant of a toll on NU’s appeal to future students. “This is something that we as leadership look at every year and talk about and struggle with is what is this going to do for our existing students as well as for new students. Right now we are ahead as far as students that are showing an interest in Northwest than we have been in a similar point in time in prior years,” Jordan said. Jordan said that students considering a Christian university will find that NU provides a lower cost option than universities of similar caliber such as Seattle Pacific University. According to its website, SPU’s current annual cost is $52,125. “I know that $40,000 is a lot of money and I’m not belittling that at all, but we are still a lower priced option than a lot of other private Christian universities, and I think that’s one of the important things people look at,” Jordan said. Jordan pointed out that students will be affected either way NU decides when forced with the decision between increasing tuition and compromising quality of education. “If we don’t do increases and we don’t pay our employees more, then were going to see turnovers on our faculty which then students are going to say ‘hey my favorite professor just left because you’re not paying him or her enough money’,” Jordan said. Tuition increases will continue to be put into place as needed in order to uphold the standard of a high quality private Christian education that NU strives to provide.